SUNRISE Romance Sahl Hasheesh is a luxury adult-only property situated near the Sahl Hasheesh Bay, on the coast of the Red Sea in Egypt. The place is a relatively new beach destination that is finding favour with beach lovers all across the world. The bay is the home to a number of islands and coral reefs, which provide an excellent opportunity for snorkelling and diving. The nearby island of Abu Hasheesh has a thriving community of marine biological life. The luxury resort is situated in a prime location on the bay and offers peace and tranquillity away from the noise and humdrum of the hectic city life. Its cosy and elegantly decorated guest rooms and suites provide every bit of the comfort and indulgence you’re looking for. Specifically designed to provide couples a few days of solitude and a chance to rekindle romance, amidst the lush surroundings of the Red Sea coast, this hotel offers a range of amenities such as a private beach with sun beds and umbrellas, 7 restaurants, 5 bars, swimming pool, spa and fitness centre. The hotel is just 18 km away from the Hurghada International Airport, which receives domestic flights from Cairo and international flights from all the major cities of Europe. The city centre of Hurghada is just 20 km from the hotel and is easily accessible. The hotel takes the concept of luxury to new heights. 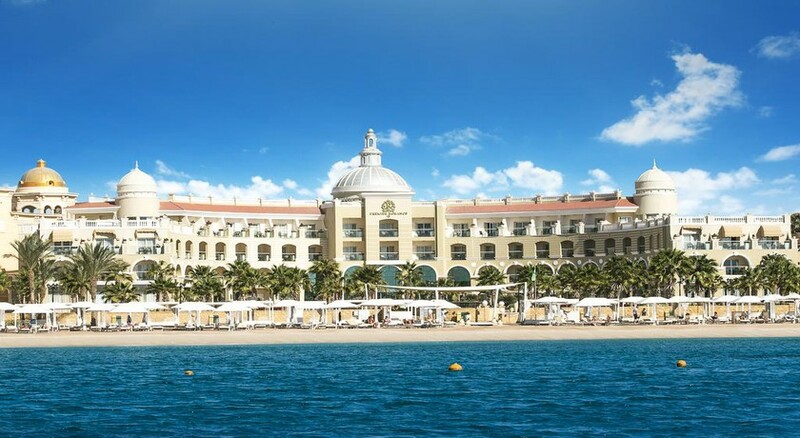 Premier Romance presents 79 beautifully furnished rooms, done up in warm, inviting tones and equipped with state-of-the art facilities and majestic windows providing panoramic views of the Red Sea outside. 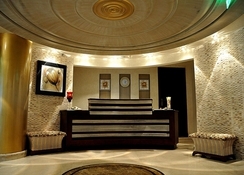 There are three types of room in the property, including superior rooms, deluxe rooms and royal suites. The royal suite has a separate living area, a marbled en-suite bathroom, private Jacuzzi and a huge terrace, where you can relax while enjoying pleasant views of the Red Sea coastline. Standard room amenities include air-conditioning & heating, satellite LCD TV, mini bar, tea and coffee making facilities, safe, free Wi-Fi and deluxe toiletries. 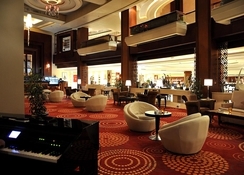 The hotel has a delectable selection of bars, cafes and restaurants serving a wide variety of cuisines. All meals, alcoholic drinks and aerated beverages are included in the Romance All-Inclusive Luxury package. The hotel houses 7 restaurants including Mozzafiato, Zhongguo, El Kamar, La Mexicana, Kashmir and Corals. 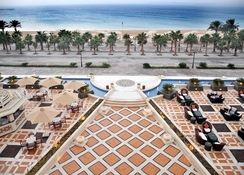 From serving drinks poolside to on the beach under the sun, there are 5 bars, of which the Lounge Bar is open 24 hours. The hotel also arranges romantic dinner on the beach for couples. The hotel’s luxury spa blends seamlessly eastern remedies with European concepts of wellness. It has six massage rooms, a separate massage room for couples, a sauna, a steam room and public Jacuzzis. 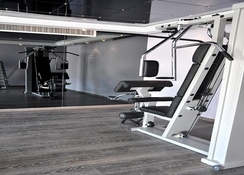 In addition to the spa facilities, there is a great workout facility that is equipped with treadmills, stationary bikes and free weights. Guests can make use of a number of leisure facilities like the private sandy beach, swimming pool, pool table, diving centre and recreation centre. The hotel pulls out all the stops to make your romantic vacation a truly memorable one. From setting up a private dinner for two at the beachfront to special honeymoon and wedding packages, the hotel provides the opportunity to make your holiday the ultimate romantic escapade. Please be informed that the below construction works are still in progress until further notification. Regarding the Above project, please note that the heavy constructions are finished, but there are still some works of painting the main building of this extension. So the work has extented until 30.08.2018. Would highly recommend to anyone wanting a relatively peaceful holiday away from children and the hustle and bustle of busier resorts. Good value for money, staff really welcoming and helpful. Stayed here for 10nights and i couldnt fault. Everyone was so friendly and lovly and very very helpful. They look after there customers and the service and people working here were so good to me and my mrs. The food lets not go there it was amazing the chef was a lovly man and his food compliments the hotel in a excellent manner.